Metrology, the science of measurement, plays a vital role in F4E's work of procuring components for the ITER machine. In the case of ITER, all components must be measured before they are delivered to the ITER site in Cadarache. This for two reasons: firstly, in order to ensure performance (that the components fulfil their tolerance specifications), and secondly, to ensure that the components, which are being produced all over the world by the different ITER Domestic Agencies will all fit together during assembly. Metrology measurements are carried out using different combinations of tools and software applications and it is necessary to take metrology aspects into account from the design phase up to manufacturing and assembly. F4E's Metrology Group exists within the Technical Support Services Unit and plays an ever more important role with the increasing amount of F4E manufacturing contracts being signed and the fact that more and more components are currently being produced. In the interest of increasing efficiency and reducing the risk for errors, F4E has now started to train partners and suppliers with which the organisation works, so that they are trained to use the same tools and the same procedures. 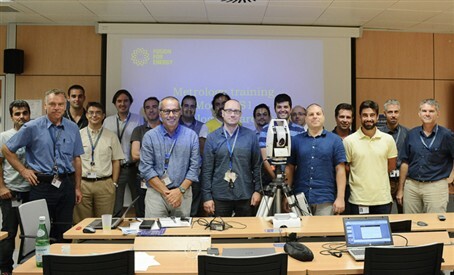 Held for two days, this first metrology techniques training consisted in theoretical sessions and a practical session which involved using the actual metrology equipment. Attendees came from European Fusion Laboratories and industry, as well as scientific organisations such as CERN. Led by the members of the F4E Metrology Group who all have a background in mechanical engineering but also specialist knowledge in the ever-evolving state of the art metrology equipment, the training was very much based on first-hand experience from working on the ITER project. "We have now noticed that our suppliers and partners now have a better understanding of the importance of a correct metrology inspection – we now speak the same language and the documentation produced by them now starts to comply to the required standards and specifications, without any necessary additional intervention from F4E"", said Luigi Semeraro, Head of F4E's Metrology Group. "All in all, we see that sharing a common metrology culture on metrology has greatly improved the efficiency of the ITER component acceptance process. We plan to continue training sessions and share updates on this ever-advancing technology on a regular basis", he added.